2022. Sarah Tilden. Born ca Jan 1612/3 in Tenterden, Ashford, Kent. Sarah was baptized in Tenterden, Ashford, Kent, on 13 Jan 1612/3. Sarah died on Mar 20 1676/7 in Albemarle County, North Carolina. On 13 Mar 1636/7 Sarah married George Sutton, son of Ambrose Sutton & Sarah Warner, in Scituate, MA. 14 Born ca 1613 in Tenterden, Ashford, Kent. George was baptized in Tenterden, Ashford, Kent, on 12 Apr 1613. George died on 12 Apr 1669 in Albemarle County, North Carolina. Elder Nathaniel Tilden came from Tenterden in Kent, with his family, before 1628. He was chosen Ruling Elder of the first Church in Scituate 1634. His house lot was on Kent-street, the 3d. south of Greenfield lane. He had also lands at Long marsh: and lands also in 1640, on the east side of the North River, below Gravelly beach. On 13 Oct 1606 Nathaniel married Lydia Huckstepp (5278) , daughter of Stephen Huckstepp (ca 1554/5-Jun 1633) & Winifred Hatch (2140) (ca 1553-Oct 1592), in Betherton, Kent.14 Born ca 1587/8 in Tenterden, Ashford, Kent. Lydia was baptized in Tenterden, Ashford, Kent, on 11 Feb 1587/8.8 Lydia died on 31 Jul 1672 in Scituate, MA. 817. Joseph Tilden. Born on 18 Nov 1585 in Tenterden, Ashford, Kent. Joseph was baptized in Tenterden, Ashford, Kent, on 28 Nov 1585. Joseph died in London, England, on 1 Feb 1641/2; he was 56. 818. Hopestill Tilden. Born ca May 1588 in Tenterden, Ashford, Kent. Hopestill was baptized in St. Mildred's, Tenterden, on 1 May 1588. Hopestill died on 19 Dec 1661 in St Marys, Sandwich, England. 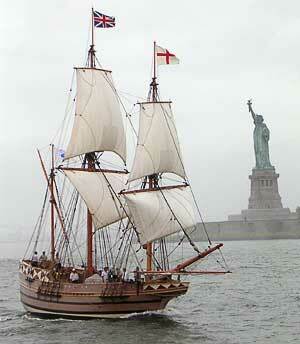 An 88-foot replica of the ship that brought the first English colonists to America. In 1634, people embarked at Sandwich for New England on the 'Good ship Hercules of Sandwich'. The following is a passenger list, taken from 'History of Sandwich, by W. BOYS, 1792, pp. 750-1'. Masters of Families. Children. Servants. JONAS AUSTEN of Tenterden and CONSTANCE his wife Four children. ROBERT BROOK of Maidstone, mercer, and ANNE his wife. Seven children. THOMAS HEYWARD of Aylesford, taylor, and SUSANNAH his wife Five children. SAMUEL HINKLEY of Tenterden and SARAH his wife Four children. ISAAC COLE of Sandwich, carpenter, and JOAN his wife Two children. JNO. BEST of the said parish, taylor.